Crossbow strings for pistol and rifle crossbows. 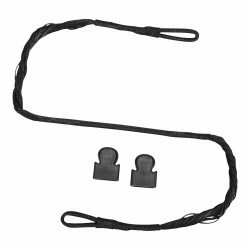 Replacement RECURVE Crossbow String.Pistol Crossbows: 50lb String - For the metal limb crossbows only, such as the Gekko or Komodo 80lb String - For the 80lb crossbows, such as the MK1 / Cobra / Rapture / Scorpion 1 / Scropion 2. 80lb Cyclone / Tomcat String - For the Cylone / Tomcat only. .. Replacement RECURVE Crossbow String with end caps.Pistol Crossbows: 50lb String - For the metal limb crossbows only, such as the Gekko or Komodo 80lb String - For the 80lb crossbows, such as the MK1 / Cobra / Rapture / Scorpion 1 / Scropion 2. 80lb Cyclone / Tomcat String ..
Crossbows Limb Tips End Caps, suitable for pistol or rifle crossbows, 50lb, 80lb (pistol), 120lb, 150lb and 175lb (rifle)..